What’s a girl to do when she’s got extra tart dough waiting expectantly in the fridge? The batch of dough I used to make the Nutella tart last week was enough to make at least three 8-inch tarts. A good thing, actually, since the crust is very buttery, has been easy to work with (despite my mishap) and holds up very nicely. I tucked away the last portion in the freezer but for my second tart I decided to make a filling out of ingredients that I had already. Enter the Medjool dates. They’re sweet but not overly so; one is enough to satisfy a sweet craving while having afternoon tea. The fruit comes from the Date Palm and is thought to be the oldest cultivated fruit. I intended to use my stash for date-nut bars but I was inspired to make a tart instead. I added almonds to the filling for some continuity with the crust and I’ll admit that I was very happy with the results. Since I blitzed my dates in the food processor, the resulting thick, sticky paste complemented the mealy texture of the ground almonds that I added. I also included some ground cinnamon and nutmeg in the filling. They lent just the right kick that the almonds and dates needed so the flavor wouldn’t be flat. As I type this post, I realize that the tart I’ve just described sounds more suitable for holiday fare but it hit the spot for us last week. I baked it late in the evening and the tart didn’t come out of the oven until after 10 pm. After snapping a couple of quick shots and having a little sliver I went to bed. When I woke up the following morning the tart was half gone and the rest didn’t last much longer after that. My husband and our friends loved it! 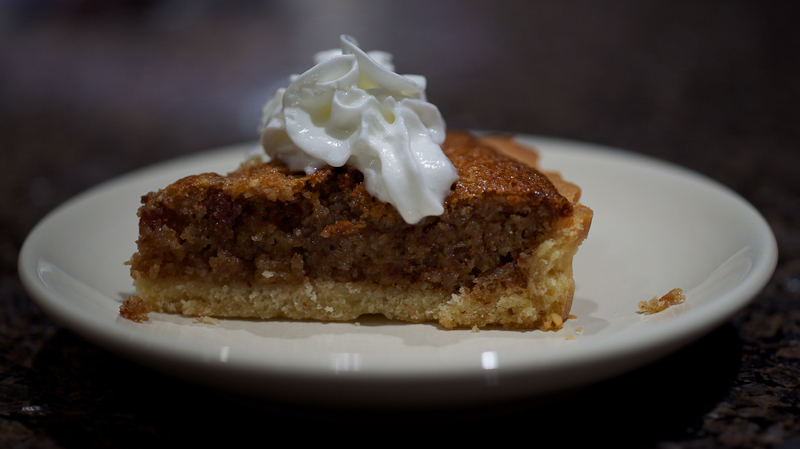 While the tart was great right out of the oven, the slice I had at room temperature was even better. The sweetness had mellowed out and the nuts/dates/spices had enough time to mingle. It was perfect with my morning tea. This is a tart I will make again and again. When ready to make the filling, preheat the oven to 375ºF. Using a mixer fitted with the paddle attachment, beat the butter and sugar until the mixture is light and fluffy. Add the eggs and beat just to combine. Next, add the almond paste, beat again, add the vanilla extract, spices and dates. Beat to combine again. Pour the mixture into the baked crust. You may have some extra filling like I did so make sure you don’t overfill the shell. Bake the tart for 25 minutes or until the center is firm and the edges of the crust a golden brown. The tart will rise but settle as it cools. Allow to cool slightly and serve plain or topped with whipped cream. What a wonderful way to cap off my evening. I only wish I had an ACTUAL piece of this sitting in front of me. Even though this would be perfect for Thanksgiving or Christmas, I am sure it would be a success all year long. It is no surprise that your husband and friends enjoyed this so much! Thanks, Monet. I really can’t believe how quickly this disappeared. I thought it would be a flop! Do you know what this reminds me of? Food for the Gods – those little date bars in the Philippines – they were heavenly as I am sure this one is too! Trissa, it’s funny you say this. My cousin was over when I considered making this and she said the very same thing. I’ve never made Food for the Gods before but she quickly pointed out to me the similarities. Yet another gorgeous tart, Jean! I am not a fan of dates but I would love to try a slice of this tart. I bet it tastes great with the nuts and spices. 🙂 If I haven’t mentioned this before, I LOVE all of your beautiful china! I love dates! I always pick up the majool dates from Trader Joes. This tart looks fantastic and perfect for a dinner party. Great photos!!! This looks superb! I will have to make this very soon. Plump medjool dates are such a treat too! This looks fab! I love dates and your recipe sounds delicious. I love dates, but don’t really enjoy having them in desserts as a stand-alone. I think I would love your combination of almonds and dates. Also want to thank you for the almond paste recipe!!!! I love dates!!! As simple as dates with soft cheese and walnuts (or almonds) or as elegant as your almond-date tart! Trissa’s right, it reminds me of food for the gods! I have to try this out soon!! This looks delicious…and reminds me of fall, which I’m so ready for! this looks amazing! i love love love dates. 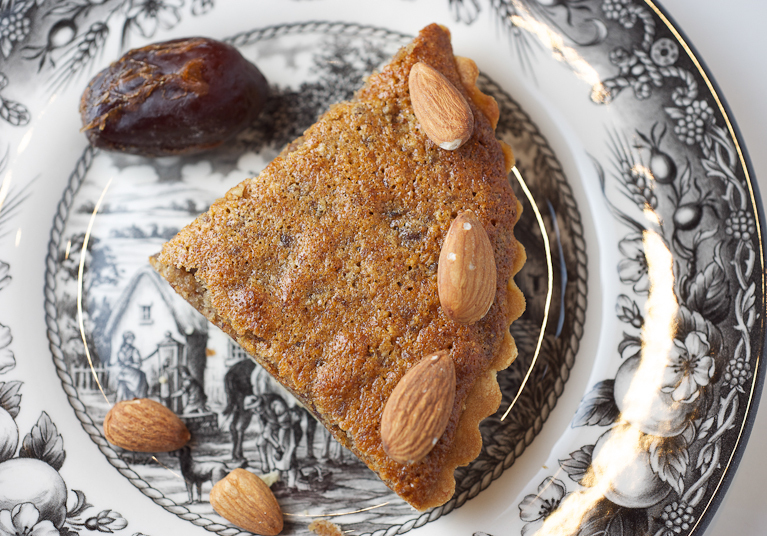 What a gorgeous tart!, love that crust, and the combination of almonds and dates reminds me of middle eastern flavors. Simply lovely! this looks so luscious! I love dates, love almonds, have never had the two combined in a tart, this is lovely! Seriously good looking tart – don’t you just love it when it turns out like that? The perfect shade of brown, looking all sugary, crisp, gooey middle…lovely! Hi Jean! What a wonderful way to use your extra dough. The tart came out beautifully and I can just imagine how lovely it tasted! While perfect for dessert, I think I would eat this for breakfast! I’m jealous of your beautiful plate. I’m a collector. A beautiful and perfect looking tart. It’s so evenly browned and the crust’s texture… Something like this, is good any time of the year if you can find those dates. 🙂 Nicely done and a keeper of a recipe. Hi, I stumbled across your recipes for my left over dates and almond and decided to try this and I love it! For step 3, instead of “Using a mixer fitted with the paddle attachment, beat the butter and sugar until the mixture is light and fluffy” ,I replaced the entire step with Skippy Peanut Butter! In addition, to fully utilise the remaining dough, I cover the tart with the dough to make it a pie! To make it more attractive, I microwave and toast it to make it piping hot and golden brown. It make a perfect dessert! Hello Jean, I have been looking all over your site for the crust you made for your Almond Date Tart. Apparently you decided to take it off your site along with your Nutella Tart. Is there a possibility of you posting your buttery tart recipe again? It would be most appreciated. Hi, Leslie. I’m not sure why it didn’t work but here is the link for the Nutella Tart which has the crust you were looking for. The recipe is still on the blog–the link just isn’t working. My apologies for the late reply. I’ll see about fixing the broken link.